I’m with Andy Burnham. In a recent letter to Chris Grayling, the Transport Secretary, Andy Burnham, the elected Mayor of Manchester, complained that the North of England has put up with second-class transport for far too long. Within the space of just a few days, Grayling has downgraded promised rail improvements for the North while overseeing contracts for the ridiculously expensive HS2 line to Birmingham and backing the £30 billion London Crossrail 2 project. Is there any wonder Burnham is angry? We have just got back from a few days in Kent. If your recent rail experience is mainly of Yorkshire, or even the routes down to London, you would be amazed at what they have in Kent. We were. There, 140 mph high speed Javelins leave London St. Pancras along the HS1 Channel Tunnel route, then branch off to follow various circular paths back to St. Pancras by Faversham, Ramsgate, Canterbury and Dover. They don’t go quite so fast along the North Kent coast, but they still crack on at quite a pace. It is not as if there are big distances between stations either. From Gravesend to Ramsgate there are fifteen stops, some as little as three minutes apart. We have nothing like it in the North. Our local line still uses screechy four-wheeled nineteen-eighties Pacer trains. Even on faster lines such as the Transpennine route, the Class 185 Desiro units have barely two thirds the speed and acceleration of Southeastern Javelins. It is not as if our services are unused. They are busy throughout the day and peak-time overcrowding is unpleasant and noxious. It truly does feel like a second-class service. It is like re-living the nineteen-seventies Goole to Leeds line. I’ll never forget the stations: Rawcliffe, Snaith, Hensall, Whitley Bridge, Knottingley, Pontefract Monkhill, Castleford Cutsyke, Woodlesford, Leeds. I used it regularly on Monday mornings after leaving home for four-night-a-week lodgings in Leeds. The train used to leave Goole at 07.20 to arrive in Leeds around 08.35. It was a bucolic start to the week. Startled rabbits dashed across the fields for cover as the morning mist lifted in the early light. If you sat right at the front you could see along the track ahead, and, oh what dreams, pretend you were the driver. I wished it could go on forever, until the train filled up with people smelling of fried bacon, stale cigarettes, fetid flannels and musty wardrobes, and then it could not end soon enough. 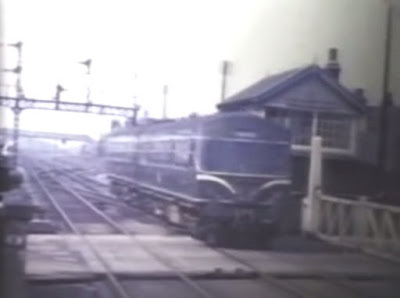 At first the train used to branch from the Doncaster line just outside Goole station (you can see the junction in the above video at 0.44), but this short length of track (which once served the Goole to Selby line) was pulled up and the train re-routed past the engine sheds. There were other creeping changes too. When Castleford Cutsyke was closed, trains had to go via Castleford Central where they reversed. At least the line was still dual track. There were six trains per day in each direction, and they could pass anywhere between Knottingley and Goole. Now, this part of the line is single track. The once great Lancashire and Yorkshire Railway that carried long chains of coal wagons from the Yorkshire coalfields to the docks at Goole, and thousands of European emigrants from Hull to the transatlantic liners at Liverpool, is but a thin and spectral palimpsest of its former self. Indeed, the only remaining train per day from Leeds to Goole, the 17.16, is often referred to as one of Britain’s “ghost trains”. They “wend their eerie way around the rail network almost entirely unknown to the travelling public,” running mostly empty at deliberately inconvenient times. They maintain the fiction that the line is still open for business, allowing train operators to avoid the long and costly public consultation required for complete closure. Currently, you could just about manage a daily commute from Goole to Leeds over this route, catching the 07.04 from Goole and the aforementioned 17.16 back. The only other train is the returning 17.16 which departs Goole at 18.49. Otherwise you have to go to Doncaster and change, which usually takes longer, or via Brough, which costs more. Or you could drive the few miles to Howden for a Transpennine express, which can take as little as 30 minutes to Leeds, but that is something of a cop out. The alternatives are no substitute for the convenience of a direct local train from, say, the lovely villages of Rawcliffe or Snaith. And what about all the other lost routes of Yorkshire? What would the Hornsea and Withernsea branches do for Hull if they were still open, or the line through Market Weighton into York, or the Woodhead line from Sheffield to Manchester? You can find example after example. How much would they benefit the local and regional economies? Let’s face it, if this were Kent, ALL these routes, including the Goole to Leeds line, would still be fully open, running regular all-day timetables, served by fast modern electric trains with ample comfortable accommodation. They would be well-used.